In a bowl mix the eggs, matzo meal, salt, garlic powder and pepper. With a food processor, grate the potatoes and onions. Wrap the potatoes in paper towels to drain liquid. Mix the potatoes into the egg mixture and blend well. Coat baking pans with lots of cooking spray. Drop a tablespoon at a time of batter onto baking sheets (about 1 inch apart) and flatten each with a spatula. Place 20 pancakes on each pan. Bake one tray at a time for 12-15 minutes until the bottoms are golden brown (use 2 ovens if you have them). Flip pancakes and bake 12 -15 more minutes until golden brown. 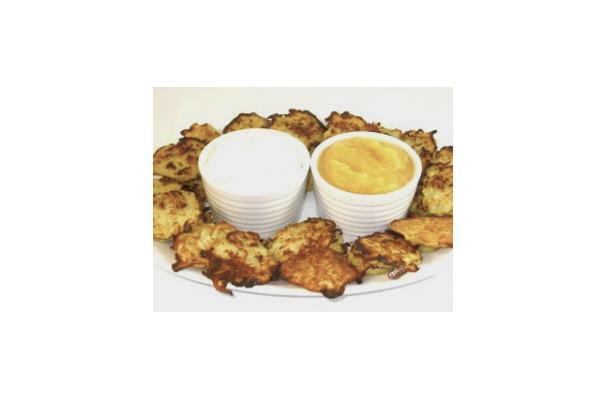 Place potato pancakes on a platter. Serve with sour cream and applesauce on the side. Serve immediately. These can be made in advance and reheated in the oven to become hot and crisp again.